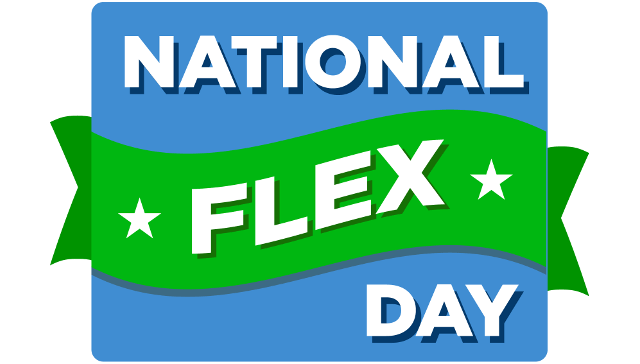 National Flex Day (#NationalFlexDay) was on Tuesday, October 17th. As part of our celebrations, we held a contest around the meaning of work flexibility. Please note: this contest is now closed and no further comments will be accepted. Starting this year, 1 Million for Work Flexibility is honored to host National Flex Day, carrying forward the torch that was lit by Working Mother five years ago. We view it as an opportunity to unite employers and workers across the country in an effort to raise awareness about the importance and power that flexible work can have for the good of both our businesses and our society. To do this, we ask that everyone—including you!—share their own reasons for why they need or want work flexibility and how having it would help their lives and make them more resilient, productive workers. Everyone needs flex for different reasons, and in different ways. Over the years, we’ve heard many reasons and ways, but to increase the volume on this issue we are asking everyone to share their personal wish or need that would help make their work and life be more compatible. What does work flexibility mean to you? Does it mean full freedom over your schedule and location of work? Does it mean the ability to work from home or switch around your hours once a week? Does it mean working from home occasionally? Does it mean having a part time schedule, or being part of a job-share? Does it mean phasing into retirement? Or something else altogether? What does work flexibility mean to you? First, start off with a good answer in the comments below to the contest question, whether it’s one sentence or twenty! Then, to get an extra entry and double your chances, share this contest on Twitter! To get credit, be sure to include your Twitter handle within your comment below, and use the hashtag #supportworkflex in your Tweet. Friday, October 20, at 11:59 p.m. ET. Please note: this contest is now closed and no further comments will be accepted. Note: Only answers that are on-topic and respectful will be published and entered. I love a flexible work hours because it allows me to have enough time for my children and family. It also enables me have a work life balance and with flexible work hours, I can decide to close early to beat the traffic and get home early. This will improve my health and also allow me get enough rest before the next day. I need flexible work in order to be a better mother, offset childcare costs, be a working military spouse, and for my own personal health. Flexible work for me means working from home during my most productive hours. As a military spouse, flexible work will allow my job to move with me and not have to get a new job every couple of years. It will allow me the time to be home with children when they are sick and for me to be able to “leave” the office when I am unwell, as well as allow for mental health days off. It will also allow for me to not have to pay as much for childcare, allowing my paycheck to go much further. For me, work flexibility means that I have better integration of work and life. I am blessed to be able to work fully remote when I am not traveling for work. Being able to pick my daughter up from school and take her to her after-school activities is so much easier to manage than when I worked in a physical location. If I need to take some time for family during my normal working hours, then I start my day earlier or finish up later in the evening. I live in a major metropolitan area where commutes can take over an hour each way; my commute is literally seconds! My employer and family both benefit tremendously from the flexibility remote work enables. Work flexibility means trust. I run a virtual company called exaqueo. We’re headquartered in Charleston, SC but most of our colleagues work from other locations. We get our work done when our clients need it, but we’re flexible on how, when and where. It’s trust and accountability that makes it work. Work flexibility is location independence, and the ability to see my family even though they are spread across several states. It is the ability to eat whole food, from a real kitchen, instead of quick bites because driving takes up most of my breakfast, lunch, and dinner hours. Work flexibility is having open windows and natural vitamin D when the weather is nice, instead of fluorescent lighting and stale air. Work flexibility is a walk with my dog at lunch, instead of a walk to another counter at a fast food restaurant because I’m in a rush. Work flexibility is replacing my commute with the chance to fold laundry so that when I’m done, I can spend time with my family instead of continuing to work on chores. It means staying home with my kids every other Friday so I can see them learn & grow, while also deepening our bond. It means more time pursuing my interests and entrepreneurship! Work flexibility means working in a way that is compatible with my work and personal life allowing me to be my personal best – engaged, productive and happy. Flexible work options mean that employers listen, trust, and value their employees. I was fortunate to job share for nearly a decade working with a supportive partner half the week while remaining a top producer and leader in my field and began the first firm dedicated to the spread this innovative, little known flexible work practice. Work flexibility means unplugging and engaging in my personal life and being able to focus and bring renewed energy and ideas to my work life. It’s finding what works best for the way you work most effectively whether that’s job sharing, working part-time or half-time, compressed workweek, phased retirement, flexible or alternative scheduling, or telecommuting. One thing it should be is transparent and available to all employees. Work flexibility for me is the freedom & blessing to be a mom & wife full time while still earning a living to financially care for my family. Its the freedom to care for & be there for my husband who is a disabled Veteran. Its freedom to be able to continue home schooling my children, it has allowed me to be at my childrens sports, and other activities. And has allowed me to continue being a college student myself! Work flexibility has helped me regain a feeling of self-worth by providing me with financial independence and intellectual stimulation. It allows me to be an active part of the workforce, while being present in my children’s day to day lives. Work flexibility has helped me regain balance in my life. With my adult child was young I worked 60 hours and missed everything. I miss first steps words it was second nature for me to here things. Flexibility gives me balance with my smaller children one who is highly accelerated autism and to be accessible to them at all times. It also allows me to take classes to keep my skill set updated and to go to conferences on my craft so I will always be in the now. Work flexibility means an employer treating me like a responsible adult and allowing opportunities to get my work done in a way that best fits my personal working style and lifestyle. Ideally, the opportunity to work from home whenever I choose. Respect and trust begets respect and trust. Work flexibility is knowing that you can grow your career and not comprise your personal life. Your able to not only make those deadlines, but also go see your child perform in their school orchestra, meet your husband/wife for lunch. It provide you with the opportunity to create wholesomeness in a microwave age. Work Flexibility means having your employer understand that while work is of course a huge priority in a mother and father’s life, family needs to come first. This means flexible start hours, the ability to actually TAKE sick hours and vacation times, and the understanding that things come up – sick children, household problems, car repairs, you name it. And when those things come up – we need to be able to address them and work our hours later. Having a flexible schedule as I do now with my current telecommuting job has made me a satisfied and more enriched employee, staying at this company for just over four years. I strongly believe employee flexibility is one of the keys to workplace retention! Flexibility means a reduction in stress. No more traffic. I want to work from home because I suffer from social anxiety disorder. It is really hard for me to work around other people. I can only work and talk to people confidently if it is done from home. I am very independent worker, but I work best on the computer, on the phone, & remotely. I currently do not have driver’s license and the town that I am in now does not have public transportation, so it would be hard for me to traditionally commute to work. There are things going on in my life right now where I would need flexible hours to work; especially jobs that I can choose how much & how little that I work. Work Flexibility means that I am a super hero. I contribute fully to all aspects of my family’s life and earn the dignity of being financially independent. It’s simply fulfilling. The term work flexibility means I provide my best work in an environment with less stress (often in my home), to meet the needs of those around me while adjusting my schedule to accommodate the workflow. Some days are busier than others, and some days allow for service to the community when it’s needed and not only when it can be squeezed into the day. Work flexibility is also associated with involvement in my daughter’s education, taking full advantage of preventive medicine and addressing health issues within my family. The benefits of being flexible also mean that I must exercise excellent time management skills to ensure the work gets done and that I meet deadlines. I always love the flexibility of my schedule afforded me, and since getting married, I have felt so grateful that I have control over my time, location, clientbase and general professional happiness. Work flexibility means being able to follow my husband’s career around the globe, but not having to sacrifice my own dreams. I can be available to my family when they need me, and when they don’t then I can contribute to society in a meaningful way. Having work flexibility means less stress. It means that if one of my children get sick, I can stay home to take care of them without risking my job. Not only do I think flexible hours are important, but I also think its important for more employers to recognize the life and work experiences of a candidate, regardless of formal higher education. For the past 15 years I first worked from a home office and then owned my own successful retail/service store where I was (obviously) able to make my own hours, depending on the needs of my children. Now, after moving five states away and closing my store I have experienced difficulty getting a position with a company because I am “over qualified” and/or “under educated ‘. It’s starting to look like I may need to start up my own business again! As a homeschooling mom, a flexible work schedule is extremely important to me. Working from home and part-time are key necessities. The possibility of on-site work at the right time of day on certain days is also feasible. Flexible work that takes time and location into consideration allows me to continue exercising the skills and interest I acquired in my education. Also, I do not want to wait until my last child graduates to work in my field of interest or a new one, as that will have been a long absence. Time for me. To be a mom, to exercise, to do laundry, to grocery shop, to prep week’s meals, to rest, to read, to learn, to be creative, to meet friends for coffee or lunch, to breathe. All so that when I’m at work I can be 100% present, and when I am home with my family, they are my focus and not disrupted or distracted or stressed by everything else needing to get done. Work flexibility means being able to take care of my family and myself without judgement from others. Flexibility means being able to put my priorities (family) at the top of my agenda each week and building my work around that. From a kiddo’s broken leg to family deaths and joyful moments in between, flexibility has given us what we needed, when we needed it. I’ve been working ‘flexibly’ for over 20 years. While I occasionally take a more traditional part time and/or temporary job to supplement my flexible income, it’s working when convenient for me that I really shine. I find I am more productive, happier, and efficient in my work when I work in a flexible arrangement. It suits my personality; it allows me the time I need to deal with family; and it honors my preferred work style – which impacts my entire life. Flexibility to me means I can be more creative at work because I am less stressed from a daily commute. It means I am home in time to make a healthy dinner for my kids (at least some of the time :). It means I can know what the weather is like during the day. It is because of flexibility that I have been able to stay in the workforce without completely sacrificing my ability to nurture the bond with my kids, husband, parents, friends, etc. It means I can be a more complete person — and that means I can deliver more for my employer. Work flexibility can mean a lot of things. For me, it is especially crucial at this time. I currently live in Dallas, but my husband got a job in Raleigh so we will need to relocate. I am negotiating for flexibility at my workplace so I can do my next job rotation from home and fly back to Dallas once a month. Companies that allow work flexibility (work from home, flexible hours and other similar arrangements) are sensitive to the human needs of their employees. They acknowledge that there is a life outside of work and that the balance needs to be reached for all of us to be happy and productive. My Twitter handle is @kar_n_twitts ! Work flexibility to me means having the privilege and ability to work entirely from home. To me, this means that I will be able to take better care of my health. It additionally means that I will be able to be there when my family needs any support from me. Work flexibility is important as it allows me to do other activities/errands and not focus as much on deadlines. Anything that has a deadline, I work my schedule as such so as to allow me to meet it. Since I don’t drive, it also allows me to still work even when other places may be closed due to bad weather. For me, work flexibility means the ability to balance all of the parts of my life in a way that enables me to do my best at all of them. Flexibility to me means the freedom of not having to sit in traffic for an hour to get to the office. I can do housework and take care of my family while I work. Quick dinners are not necessary because I can leave the comfort of my home office and be in the kitchen making dinner from scratch if I choose or just order a pizza. The flexibility of being able to answer my cell phone and have a conversation with my sister who is having a bad day and not having to worry about who will be listening or the need to cut her off when she just needs a shoulder to lean on. The main reason is being available to my husband who is a heart patient and making sure he is taken care of and his doctor appointments and medication are managed. Most of all the ability to be less stressed while I make myself available to help friends and family while working to provide for my family. Flex hours offers tremendous productivity improvement. So there is more thought leadership that comes to the table, and that’s where your creativity and innovation come in. We all struggle with work-life balance and there’s no easy solution. I think everyone needs to find the right balance for themselves. Telecommuting, one of many forms of work-life flexibility, should no longer be viewed as a nice-to-have, optional perk mostly used by working moms.We need to de-parent, de-gender, and de-age the perception of the flexible worker. Technology now allows people to connect anytime, anywhere, to anyone in the world, from almost any device. Work flexibility means being able to stay at home with my children while making money, it is very important to me to be there for my children instead of being away all day then coming home tired from a long day at work followed by a long commute home. Work flexibility, to me, is the way I can learn to love my job and love my family even more than I already do. It’s all about loving more, because having a work environment that overall believes in me and my ability to do the job right is showing me love and appreciation, and I can demonstrate my love for my profession and for what I do for a living. It is about loving my family more and better, because it enables me to give them more of my time and enjoy each other’s company better. To me, work flexibility is about not being scared to ask for what you need. I was able to ask—and receive—one day a week at home. I can also let my manager know when I need to come in late, leave early, or take a long lunch. I can’t imagine being a mom to a young child while working a job that is completely rigid. Having work flexibility allows me to contribute to an organization with a healthcare-related mission that inspires me, while also staying very involved in my home life with my husband and our young son. I can’t imagine being a working mom without work flexibility! Work Flexibility means being able to work when I’m at the top of my game. An 8:00 am – 5:00 pm does not always cut it. Sometimes you need to be able to work just a few hours, then there are times where the “juices” are flowing and you don’t want to stop because you know deep inside that you are in a place of the ultimate design. Work Flexibility can bring peace, serenity, and tranquility to one’s life. I’ve life-hacked, delegated, outsourced, engaged my support network, rocked every crockpot meal, and mastered my time management all in an effort to the achieve the mythical work-life balance. I thought that by doing everything the blogs and experts told me then I would finall have enough family time and energy to run my household as well as work outside the home. Work flexibility was the missing ingredient to my working mother special sauce. giving hand and arm massages to seniors that have arthritis and enjoy my time doing it.Having the flex time can give us the ability to give of our time that would enrich our life and others..Thank you have a blessed weekend. Work flexibility is a wonderful thing for me as it allows me to control my schedule. With teenaged children in activities and aging parents, I need to be able to make changes in my day . With Minnesota winters, not having to travel in rotten weather is a huge plus. Work flexibility is imperative to being present in every aspect of my life: as a partner, as a parent and as a professional. As long as I can remember, I have watched my mother work 60+ hours per week in an office for someone else’s benefit. That left little time for me and my brother (think “latch key”) or herself. I knew once I became a parent I’d want something more and I am fortunate to have found it. I have three boys ranging in age from 12 to 23 and my oldest has severe special needs, so I will be forever grateful and downright giddy that I found a way to balance work and family in a way that benefits them, my professional goals and our family’s financial needs. Work flexibility to me means I would be able to work. I have a disability that makes it almost impossible for me to hold down a “real job”; but if I had the flexibility offered by many of these jobs, I would be able to work. I would be able to enjoy more of a work-life balance and have time to catch up with life and family. Flexibility in work means being able to come in and get work done, but not necessarily on a traditional 9 am to 5 pm schedule. Also. not having to hassle in traffic on the weekdays is a nice perk or doing your work in a relaxing café seems to be less stressful than a cubicle. Work flexibility would allow me to manage my disability, and not allow it to manage me. Being able to work from home occasionally would make me more productive the days I find it difficult to get out of bed and get dressed. I had a job where I could, on occasion stay home when needed; I could just roll out of bed to my recliner and work from my lap top. While I was physically spent, I could still be productive. I miss that opportunity – the rest of the job was too stressful and I needed to change positions. I now have a great GM who works with me on flexible schedule for dr. visits and such. Work flexibility means working to my fullest potential, because I have more control over my time. I can handle my home life responsibilities in a more efficient manner allowing me to focus more when I am working. I find that I am happier and more productive all-around when my commute can be eased, and my personal responsibilities more conveniently handled when it works for me. I spent most of my youth leaving for school and coming home to an empty house while my mother worked. Work flexibility provides me the opportunity to be available to my professional and personal lives. As a remote employee, I can work with limited distractions and give my whole self to the job to be completed. Whereas I can also be available when needed to address family needs as they arise. I can fulfill the needs of my work/life responsibilities without feeling I’m letting one of the down. My work and family know that I am fully committed to both while keeping them in balance. Work flexibilty makes it easy for me to take time to do all the things that can only be done during business hours, like wait for the cable guy, doctor appointments or any other appointment. I can fit it all in and get it all done. Having the flexibility to work from home is such a huge benefit to many employees for many reasons. During the years when my children were young and needed more of my attention, I was not able to work from home, but I was fortunate enough to have an employer at the time to allow me to continue my career part-time. I had to ensure them that I would complete my former full-time tasks on a part-time basis. Although the challenge was great, it allowed me to only have to be in the office 3 days a week and if I needed to, I could come into the office and complete my tasks on Saturday and/or Sunday. This was such a blessing at the time as I have memories with my children that I would have missed had I not been given this special opportunity. If having had the opportunity to continue on a full time basis and being able to work from home would have even been a greater privilege. Although I would not have done it any other way at the time, it was expensive and put us in tremendous debt. I had 4 children under the age of three at one time. As you can imagine, formula and diapers alone set up back quite a bit. Working from home can help many employees in many other circumstances as well. I was fortunate to have healthy children, but if I had a special needs child, my needs would have been very different. Allowing employees to care for their children in this circumstance is huge. Another way this would help employees is if you have aging parents that need your attention as well. Many individuals are not able to afford a good full-time care giver for the parents, and the burden (although that’s not the proper word for it) or additional responsibility is required to ensure they can return the love and care given to them at one time from their self-less parents. Having the flexibility to continue on a successful career path while also effectively carrying out home and family responsibilities, can retain viable employees contributing to your company’s productivity and profitability. I am past the time of raising kids, but during the teenage years it would have been invaluable. Just to be present and have them know I was around. Teenagers go through a lot of challenges and keeping an eye on them matters, they also sometimes still need to know you’re there for them even when they don’t want to engage. Who babysits teenagers? No one. There are so many resources for little children. Now, I want to be geographically free. I would like to be a snowbird and live in the Midwest part-time and in the South where my family lives. I want to work anyplace I have Wi-Fi. That’s my goal and my dream. I also commute a very long time every day. When allowed to work remotely, I recapture 2.5 hours of my day and usually use that to work more and exercise. A healthy benefit. Plus, no need to spend all that time grooming and dressing for success. Work flexibility is the freedom to choose where you will be most productive on any given day, week, month or year individually or collaboratively with your colleagues and teams. It’s the opportunity to choose from a variety of workspaces designed for human connection in ways that foster innovation and creativity – the building blocks for driving business forward today. For companies, work flexibility is a strategic business imperative, a way to demonstrate how your company is an employer of choice, one that meets the needs of preferred mobile work styles everyone wants today and is an investment in attracting and retaining talent and optimizing real estate. For people, (women and men), work flexibility is about having the freedom needed to carve out a life that works whether you choose to have a family or not. It’s the ability to say you will avoid 2+ hour commutes 1 or more days a week to work remotely; it’s the ability to come into the office beyond peak traffic hours to avoid that stressful commute, it’s knowing leaders at all levels in a organization are committed to a culture of flexibility and embrace a results-oriented work environment. The ability to work with you on your Schedule both of you working together to find a fit for the Company and yourself. Being the Care Giver for my wife Flex Scheduling allows me the freedom to go home and take care of her and her medical needs. Work Flexibility to me personally and as a Manager is a full acceptance of each person’s unique values and what defines their Quality of Life. From where to live, how to manage time/family, and other personal committements: Work flexibility allows a person to bring their whole self to work while finding accomplishment by managing their own time and focus. For me personally, work flexibility drives loyalty and committment because the organization sees my work contributions valuable and offers mutual trust. Work Flexibility is allowing a temporary change in schedule, by request, in order to accommodate outside-of-work obligations. I have worked for 30 plus years and never have had a job with Work Flexibility. After my jaw was brought up off the ground I was extremely happy to hear that this business offers Work Flexibility. This gives me the opportunity to enjoy my son’s last year of high school and to be able to attend fun events with him. It also gives me the confidence that if I have a doctor appointment there is no issue. Yes I wish when my kids were younger I had Work Flexibility, but I am happy it is here for the parents with young children. I think an employer who provides work flexibility is giving their employee the ability to design and complete their job in the manner best suited for that person’s life. It may look like regular part-time work, telecommuting, or a different schedule every week. There has to be mutual respect and trust between employer and employee. I have not worked full-time since my oldest child was born in the mid-90s. I am so thankful to have had multiple employers willing to let me work less than full-time. I believe in work flexibility so much that I started blogging about it in September 2017 because I want to encourage others to pursue NOT settling for full-time work if at all possible. My website is DownsizeYour2080.com and my Twitter account is @UpsizeYourJoy. Come join the conversation! Work flexibility means that I can work from home one day a week, saving gas and travel time to be more productive for my employer. It means that on that morning I get to make breakfast for my children, and be home when they get off the bus and want to share the details of their day. We spend the afternoon around the table enjoying homemade cookies doing our work and homework together. I have been blessed to work for two companies that offered flexible work schedules. When you have a long commute and a full life, this amenable structure offers you the means to be better at work and at life. Win win. As a retired veteran of 22 years, I have worked any and all shifts. Now that I am working a M-F job it is a whole new ball game for me. To have a Flex schedule, would allow me to spend time with my daughter once she gets out of school, as well as work at my own pace to ensure my work is accurate and completed in a timely fashion. It would reduce my expenses for gas and more valuable…my time. By working a Flex schedule, just knowing it is there and something to look forward too, boosts my morale and productivity. I also have a granddaughter with a medical condition, which would allow me to be available for her treatments when she comes to visit me in the summers. I think the Flex schedule is a great thing to offer families with children and medical situations. I hope it is used for the purposes it was created and not abused. Flexible work arrangements means I get a healthy work-life balance. I’m able to tend to my (growing) family as I need to and still earn a paycheck to keep food on the table. My employer values me, the work that I do, and trusts me, and therefore reciprocates by offering this perk. I can work from home as needed with no questions asked. It really is a win-win situation. I can be found on Twitter at @savingamyblog and @amylotame. Work flexibility means being able to take kids or myself to an appointment, without using up sick or vacation hours. It means being able to recover from surgery, without a negative impact to my job. It means that my husband’s mental health can be cared for, without me having to choose between his stability/the safety of our children and my job/career path. Work flexibility means an employer who understands that my life is not all about my work….that balance is needed. Work flexibility means I am willing to do more and able to do more for both my company and my family, without worrying that I’m sacrificing one for the other. For me, a flexible work schedule would be great so that not only do I have time for my family, but also for the other 1 million errands that have to be done. I have 3 boys and although they are not babies they still have a lot of extra curricular activities I am unable to attend because I am at work. Also a flexible schedule, or working from home, will allow me to set up appointments for doctors visits, go to the bank, get dinner ready early, help with homework at an earlier time and other tasks without using my PTO or having to go to bed after midnight. It will allow my brain to focus on one thing at a time and be more attentive, not distracted, at work and home. The ability to work from home and not have to drive in traffic to and from work. Work gets done on schedule and less gas to put in the tank, Also good for the environment. Workplace Flexibility provides me the opportunity to be the best ‘whole self’ I can be…at work, at home, in my community, for my health, my family. Work flexibility gives me the opportunity to be available at home when needed! My mom lives with me and I love being available to take her to doctor appointments, etc. I enjoy working from home. Flexibility means you can both achieve your career goals and you family goal without having to sacrifice one of them. It means you can work efficiently at a time or at a place that works for you and is compatible with work, but that also fit with your personal circumstances to let you be at your best.